Job verification is the act of reviewing and proving the employment status of a person. The goal is to determine whether an individual is entitled to general or specific employee benefits outside their work environment. How long it takes to verify an employee depends on the employer. In cases where a boss has their hands tied, a member of staff may have to practice patience to get their status verified. In some cases, however, the verification process can happen the same day. You may also see Verification Forms. 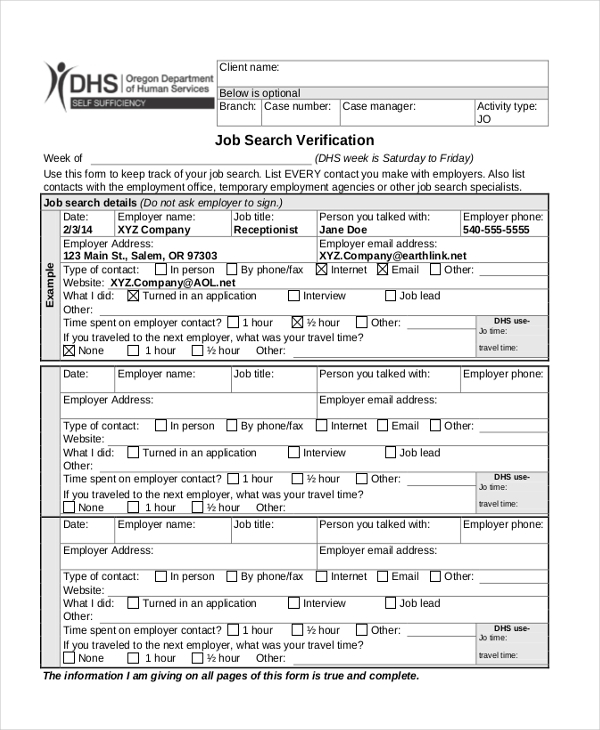 A Job Search Verification Form is a sample document filled out by an employer on the behalf of an employee seeking for an employment opportunity outside their parent company. The form is comprehensive and easy to fill out. A potential employer may request to verify the reference on an employee’s resume. To get the accurate details, an employee may ask their previous employer to verify him or herself as a reference. This form can help with the reference verification process. A new employer outside your parent company will be more interested in verifying your job history before hiring an employee. 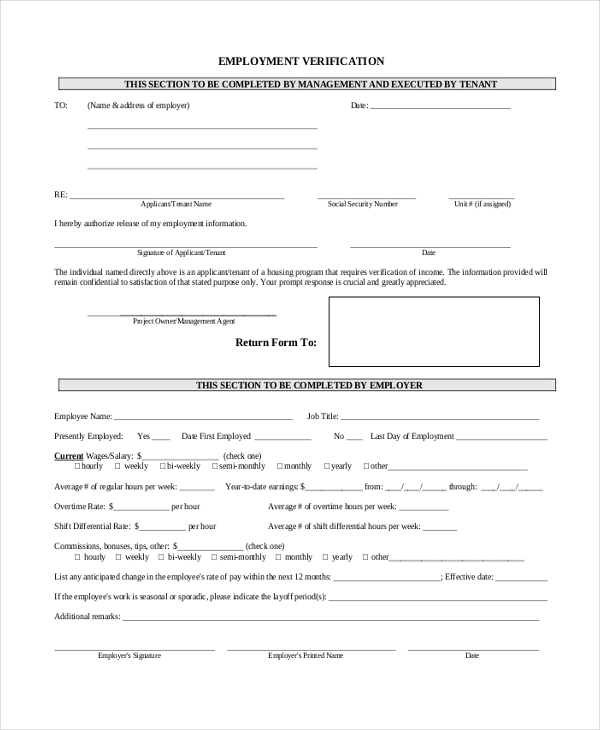 Help an employee get recognition in their job change by filling out a Job History Verification form and signing the document to prove their employment status. 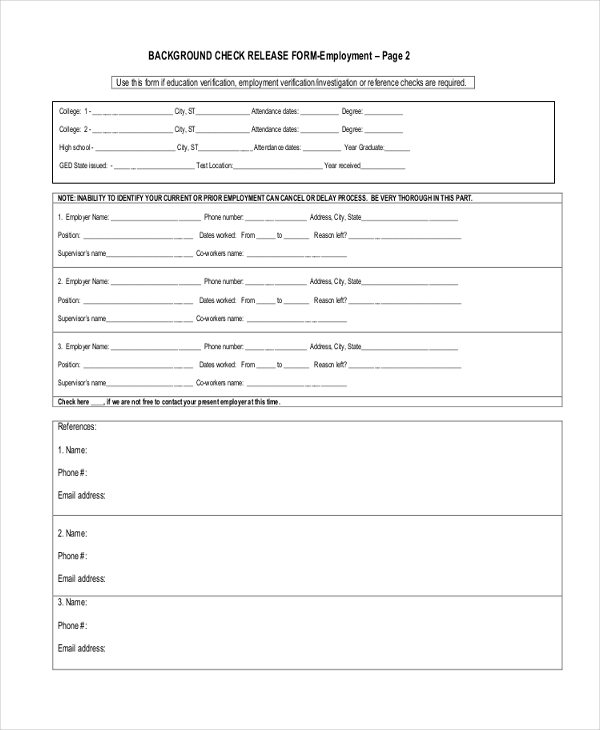 A job verification form is almost always easy to fill out, so it should not take you long to verify the employment status of a worker in your company. The template is free to download, and you can use it as is without customizing the design layout. An employee looking for a new work position outside your company may be asked to submit a verification form to prove that they have a past work history in their parent company. You can help prove their employment identity by filling out and signing this form. Before an employee can work as a foreigner in the United States of America, an employer must sign an Employee Verification authorization document to approve the employment history of the member of staff who would like to work in a foreign country. The income verification form is a document filled by an employer on the behalf of a member of staff to confirm that they are employed and receiving an income at the end of every payment period according to the payment policies of the company. 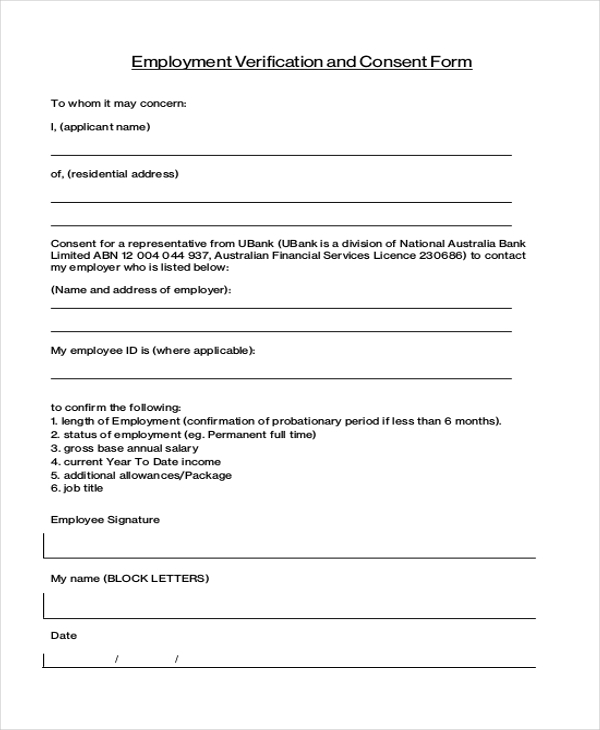 If an employee in your company would like to take a loan from a financial lending company, you can use this form to verify that they are employed in your company and that they qualify for the loan they intend to request from the financial lending institution. What are The Advantages of Employment Verification? Potential employers ask for job verifications to be certain that an employee has not only worked in a previous company but also has the experience required for the best job on the market today. Employers want to make sure they hire the right people, and the only way to do that is to use the forms. 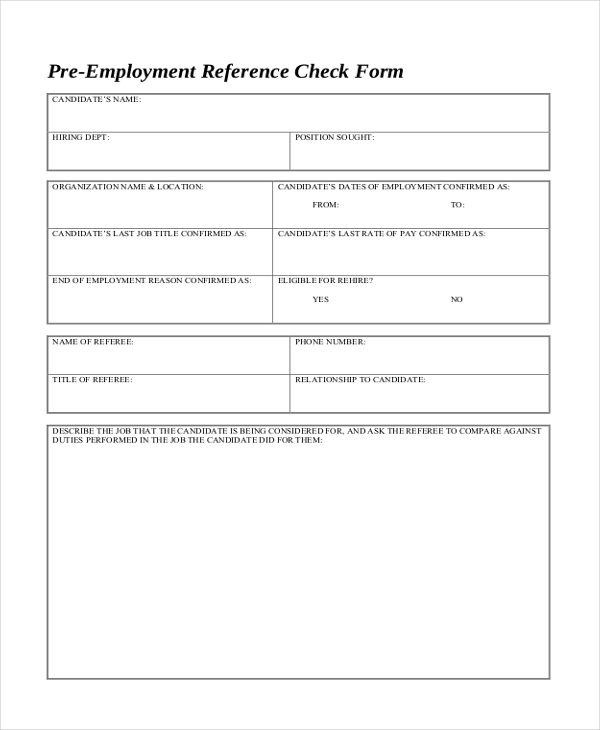 You can also see Sample Employment Verification Forms. One of the most important things to keep in mind is sample forms were not created stop you from designing yours. The problem is designing this kind of form often takes a lot of time. Because they are already designed for you, it would be important if you downloaded them instead. At the end of the day, you save you a lot of time. You may also see Tenant Verification Forms. Employees who are looking for employment outside their parent company can use Job verification forms. Usually, the purpose of this form is to provide sufficient information that proves that an employee is who he says he is in the terms of his current or former workplace as well as their experiences. you can also see Insurance Verification Forms. Job verification forms are important because of the roles they play. An employee uses them to provide solid evidence or proof of a situation. For example, an experienced member of staff searching for another job outside their parent company can use the job search verification to prove they are searching for work. 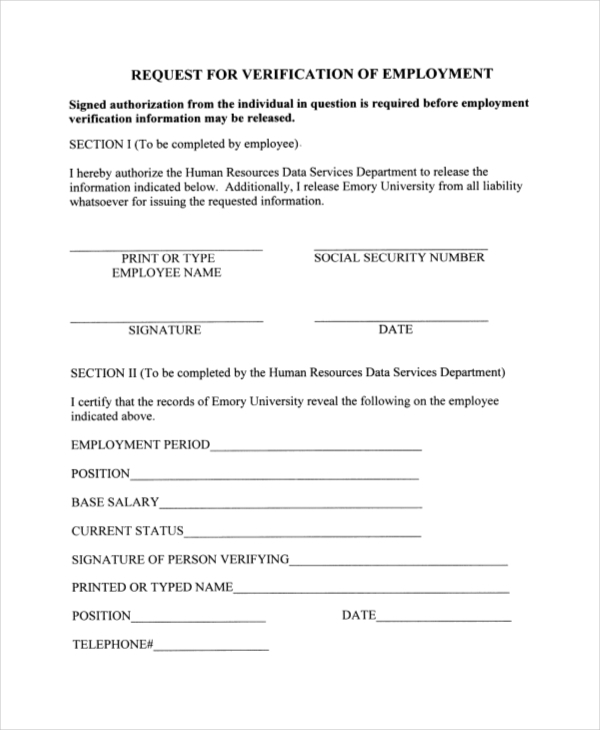 An employer also uses the verification form. A good example is employment authorization form, which they use to authorize an employee to be a member of staff in their company. You may also see Work Verification Forms. What is The Use of The Job Verification Forms? In examining the uses of the job verification forms, it is important to understand that the files are not similar. It means that each file discussed above have different uses and must therefore not be treated similar documents of the same function. For example, job search verification and employment authorization are two dissimilar files, and therefore they have different functions. Please refer to the short description above for the functions of the file. 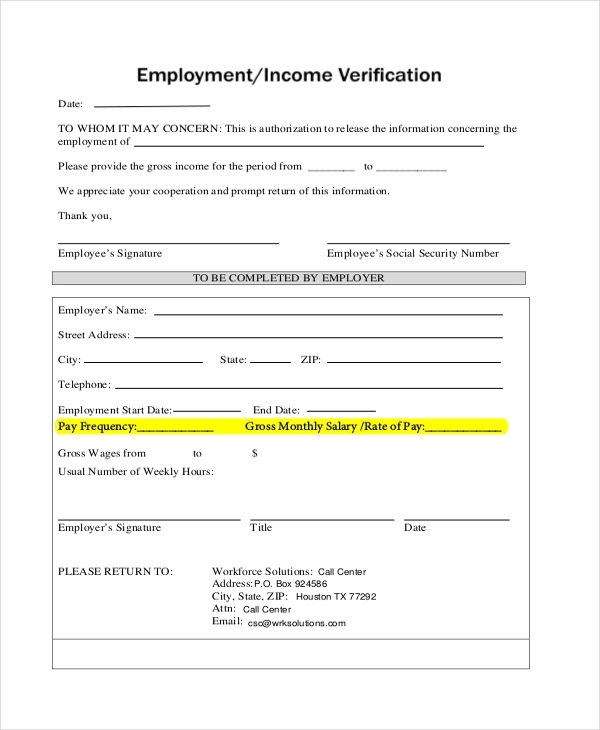 You can also see Wage Verification Forms. Employment verifications are often necessary, and there are inexhaustible reasons why employers and other bodies may request for the information. While it is easy to create the forms yourself, the best bet is to download a free template already outlined here for you, and then use the template to verify the status of employment of a worker.